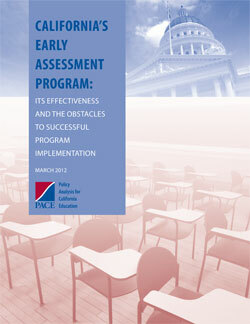 The Early Assessment Program (EAP) has emerged as a national model for states seeking to design policies that increase the number of students who leave high school ready for college and careers. In addition, the two national consortia designing new assessments aligned to the Common Core State Standards have recognized the EAP as a model for the design of new high school assessments, which California will implement in 2014-15. The report was written by Hilary McLean of Capitol Impact, LLC. Like most other universities in the country, the University of California (UC) requires that students submit scores from either the SAT or ACT exams as part of their application package. These tests have their origins in the efforts of a handful of elite colleges and universities to expand the socioeconomic diversity and enhance the academic promise of their admissions pools; to reduce the number of tests students must take to apply to college and the burden this places on both prospective students and postsecondary institutions; and to provide a means of comparing students who attend different schools with potentially different grading standards. Like most other universities in the country, the University of California (UC) requires that students submit scores from either the SAT or ACT exams as part of their application package. 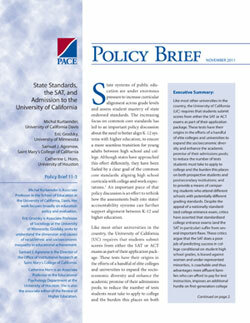 These tests have their origins in the efforts of a handful of elite colleges and universities to expand the socioeconomic diversity and enhance the academic promise of their admissions pools; to reduce the number of tests students must take to apply to college and the burden this places on both prospective students and postsecondary institutions; and to provide a means of comparing students who attend different schools with potentially different grading standards. Despite the appeal of a nationally standardized college entrance exam, critics have asserted that standardized college entrance exams (and the SAT in particular) suffer from several important flaws. A previous working paper argued, that, to understand basic skills education, it is necessary to observe classrooms to see what the “instructional triangle” involving the instructor, students, and content is like. This working paper presents the results of observing classes in 13 community colleges. It starts with a conceptualization of instruction, distinguishing behaviorist teaching, constructivist teaching, and hybrid teaching that combines the two (as well as several other dimensions of quality), and provides various reasons why hybrid or constructivist teaching is likely to be more effective than behaviorist teaching.